My husband and I recently toured Morocco for two weeks. We were with a small group of people, a guide, and a driver. I recommend this mode of tourism in a country whose language you don’t speak. This trip was a years-long dream for me, and I was not disappointed. Our guide was Berber, having grown up in a village in the Atlas Mountains. He was also Muslim, and it was a great gift to hear his explanations of history, culture, and land as viewed through an authentically religious lens. His Berber culture and Islamic faith had shaped him, just as a Midwest culture and Christianity shaped me. It was obvious to me that his way of life sprang from charity, justice, and decency—three virtues that have guided me within my Christian faith. 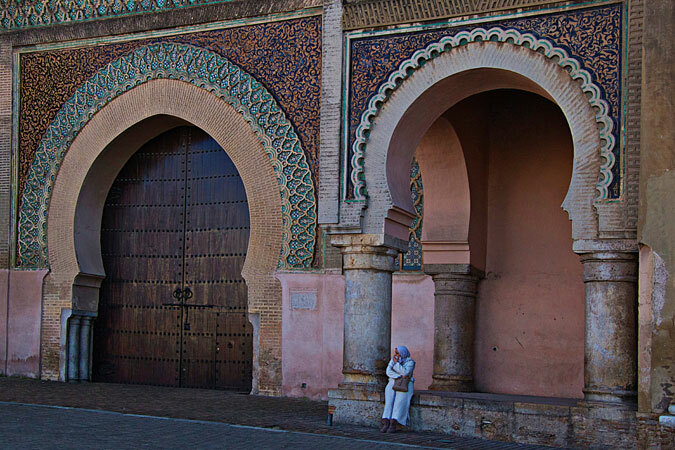 When you see the landscape of another culture—in Morocco, everything from sand desert to lush farmland to snow-topped mountains—you are reminded how much the earth we live upon shapes us too. My forebears in America learned to read the weather because they tended crops, or they learned to read rock and soil because they were coal miners. 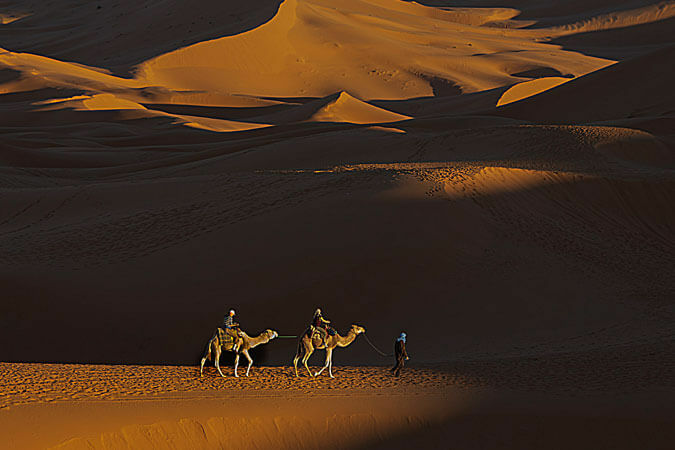 Moroccan people groups—and there are many—developed their lives in partnership with farmland or fishing waters or the dromedaries (one-humped camels) they relied on to survive in the regions of endless sand dunes. When you see the ruins of former kingdoms and hear the long stories of battles, victories, losses, occupations, migrations, populations rising and falling, you remember that, in every situation, people fight for power over their own lives—and sometimes over others’ lives. Those in power build the palaces, and whatever faith they profess determines the architecture, sculpture, and painting of their palaces but also many public buildings. I live in a specific environment, and so do you. How does that environment shape us? Where does our faith connect to the land and sky, to our livelihoods, to the buildings in which we live and work? How does our faith connect to the very language we speak? Although our Morocco trip was a vacation, in some ways I could make it a pilgrimage, because I sought to pay attention and pray my gratitude throughout. Now that I’m back home, perhaps I will attend more closely to home as well. How does your physical environment influence your feelings, worldview, and behaviors? In your immediate community, who holds the power, and what do they do with it? How do you respond? Photos provided by Vinita Wright. Definitely where we live shapes us, models us, just like clay. What we see, hear, even breath, the smells, all of these things influence who we are and what we do with our lives. I lived in a small rural town in Mexico and the smell of wood meant my neighbors were about to eat, they had to make a fire to cook, no stoves. Just the smell remembered me to pray for them, for what they were about to eat. It is a gift of God to be able to see beyond our horizons and appreciate it. What a lovely example of attentiveness leading naturally to prayer. Thanks for sharing this! I had to smile at these questions as we have just moved to a gated community with Home Owner’s Associations and the inevitable CC&Rs. The HOA is definitely the power holder here, so much so that I am already at odds with the organization. Ludicrous requirements that after thinking it over I will abide by for the time being (no more than 40% of your outdoor area may be colors, the remaining 60% must be green). This strikes me as a systemic failure brought about by folks with too much time on their hands, so I will try to work against this from the inside of the organization. This doesn’t sound like much to many people, but I see it as an outfall of the hatred for “others” who are NOT LIKE ME! as if ME was worth everyone else’s discomfort. This is a real praying matter, asking God to help these folks not vent their disatisfactions on many many people who live here (no cars parked in the driveway; must be garaged at all times). There comes a point when it isn’t funny anymore. But out and out quarreling won’t help. The culture and expectations are not at all what fits in with my point of view, but I will try hard to be as accommodating as I can. So pray for me and my new found way of life. And thanks for bringing all this to my attention. It’s not a different country, but it sure is a different world. Pray that I can adjust. And thanks for your insights in this area. Wow, Helen–if I were in your situation, I’d need lots of prayer, too. You’re right–it may not be a different country, but it’s certainly a different world. Peace to you as you navigate it with Jesus’ love and wisdom. Thank you for sharing some pf your Moroccan trip. It reminded me how much different places can influence how we believe and worship. I’ve also visited Morocco Vinita. Our guide was a Spaniard, Julian, who is married to a Moroccan woman and had previously lived in Morocco for a number of years. The culture is very different to my own, however, the similarities are there as well. ‘Power’ is a difficult concept, isn’t it. No Christian should be in the business of power and, so, it should be examined where it is wielded by others. Thank you Vinita, for this excellent essay and wonderful photos. God bless!